Shown above is the KLAW Stand just before the opening of the 2014 Offshore Technology Conference in Houston. 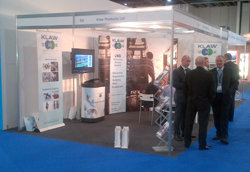 KLAW and KLAW LNG were exhibiting on the Stand, along with their sister company Gall Thomson. 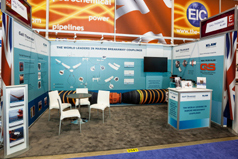 The interactive display featuring the QS Dry Disconnect range and the latest in offshore LNG transfer technology proved to be remarkable attractions and the Stand was extremely busy throughout the four days of OTC 2014. KLAW offers a range of marine breakaway couplings and connections that minimise the risk of spill all the way down the line. 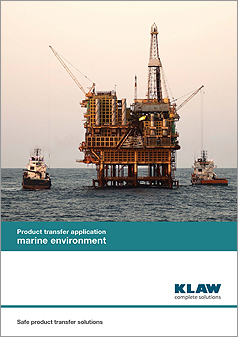 This range is now summarised with the launch of the KLAW Marine Application brochure. The brochure includes market leaders such as the KLAW Marine BAC, Full Bore Breakaway Couplings, the KLAW Emergency Release Coupling, the QS Dry Disconnect range, Swivel Joints and Flange Camlocks. +44 (0) 1373 827 100. KLAW offers a range of breakaway couplings designed to minimise the risk of Industrial Gas spillage. 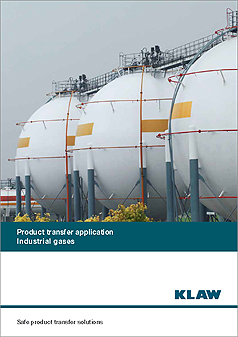 This range is now summarised with the launch of the KLAW Industrial Gases Application brochure. The 8-page brochure includes illustrations and explanations of how KLAW breakaway couplings minimise risk in product transfer applications such as Tanker, Railcar and Refuelling Stations. The benefits of the KLAW K1 Industrial Coupling, the KLAW K2C Cryogenic Industrial Coupling and the KLAW Emergency Release Coupling (ERC) are discussed along with a summary of typical media applications. 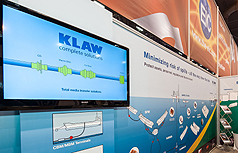 Offshore Technology Conference 2013 in Houston proved to be a great success for KLAW. 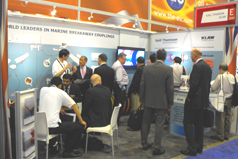 The Stand concentrated on efficient and safe transfer systems in the marine environment and the KLAW proposition of complete solutions generated immense interest. 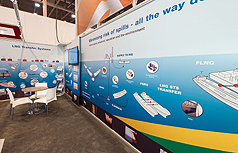 KLAW shared the Stand with its sister company Gall Thomson and the unmatched mix of products for safe and efficient offshore transfer systems delivered a unique element to OTC Houston 2013. 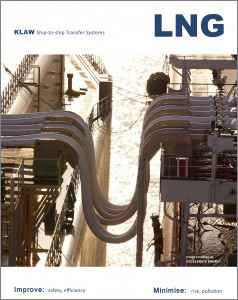 KLAW has published an eight-page brochure introducing the range of emergency release couplings (ERC)available for LNG Ship-to-Ship transfer systems. The brochure contains KLAW Cryogenic systems, including Hydraulic Power Unit (HPU) control systems and Cryogenic Flange Camlocks. A interesting section into the development of KLAW cryogenic Emergency Release Couplings provides insight into why KLAW is a global leader in providing reliable ERC systems around the world. KLAW had a vibrant four days at Gastech London. Our people were busy with constant meetings with existing and new customers and the Gastech conferences proved to be both extremely useful and enlightening as to the variables and direction of LNG around the world. The KLAW Stand at D6 concentrated on LNG and the benefits of using KLAW Emergency Release Breakaway systems within LNG STS transfer systems. The feedback from visitors to the Stand was positive and the LNG STS brochure produced by KLAW for the show was confirmed by visitors as informative and easy to read. KLAW is already looking forward to the next Gastech scheduled for South Korea in 2014. 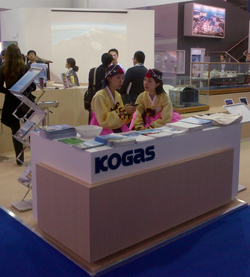 The sponsor is KOGAS and the KOGAS Stand at Gastech London was impressive – along with the stylish costumes.